This week we take a look at how to set up and use BeerSmith with the “Brew in a Bag” (BIAB) home brewing method. Brew in a bag offers simplicity in all grain brewing with less overall equipment expense and less cleanup. Brew in a bag methods and equipment are outlined here. A large number of single vessel “all in one” brew systems also use what is essentially a BIAB method. These include the Grainfather, Braumeister, Brew Boss variants, and Brewha BIAC. Others such as the Blichmann BrewEasy use a two vessel (Kettle-RIMS) variant, but you can also use a BIAB mash profile to develop total water volumes for these systems. Profiles for many of these systems are available as add-ons under File->Add-on->Add in BeerSmith. [Full disclosure: Equipment links in this paragraph only are to affiliates who support BeerSmith sites]. Lets begin with a short discussion of what BIAB brewing is and is not. 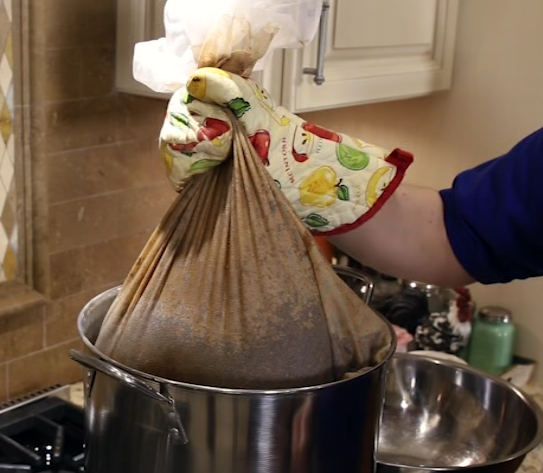 Brew in a bag refers to all grain beer brewing where the beer is mashed and boiled in a single large pot using a grain bag or stainless insert to contain the grains during the mash. Traditionally this is done using a large mash volume that is larger than the boil volume needed for the batch so you can simply remove the grain bag and start boiling at the end of the mash. If you are separately heating water and sparging with it at the end of the mash, you are not doing a traditional BIAB method but instead performing something closer to a batch sparge. You can, of course, mash a high gravity wort and then add additional kettle top up water after the mash which would still be a BIAB method. This would probably result in lower brewhouse efficiency as you are essentially diluting the wort from the mash with top up water. 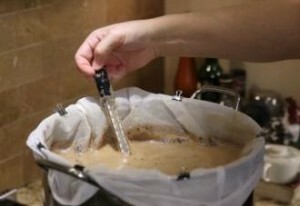 For the purpose of this article I’m going to cover the traditional BIAB method in BeerSmith. Using kettle top up water would be the same except you would need to set the Top Up Water for Kettle field in the equipment profile in BeerSmith, and also lower your Brewhouse Efficiency to account for the lower efficiency of the overall system. I’m not going to cover batch sparging or conventional sparging as these require a hot liquor tun and would use a traditional infusion mash profile. The settings for BIAB equipment are not substantially different from any other setup. Create a new equipment profile using the Insert->Equipment Wizard selection in BeerSmith. I’ll walk you through each page in the equipment wizard. Name your equipment and define your Batch volume which is the volume into fermenter – typically around 5 gal (19 l) or 10 gal (38 l) for home brewers. Estimate your Fermenter Loss between fermentation and bottling which is usually a few quarts (liters). Top up water (post boil) is typically zero for BIAB systems. Losses to trub/chiller can vary from a few quarts (liters) to a gallon or more depending on whether you bag your hops and what chillers system you use. Proceed to the next page. On the next page set your Boil Time which is typically 60 to 90 minutes. You will need to estimate your Boil Off rate, but 15% per hour (of the boil volume) is not unusual for a home brew system. Make sure the box Calculate Boil Vol Automatically is checked and that should give you your pre-boil volume. 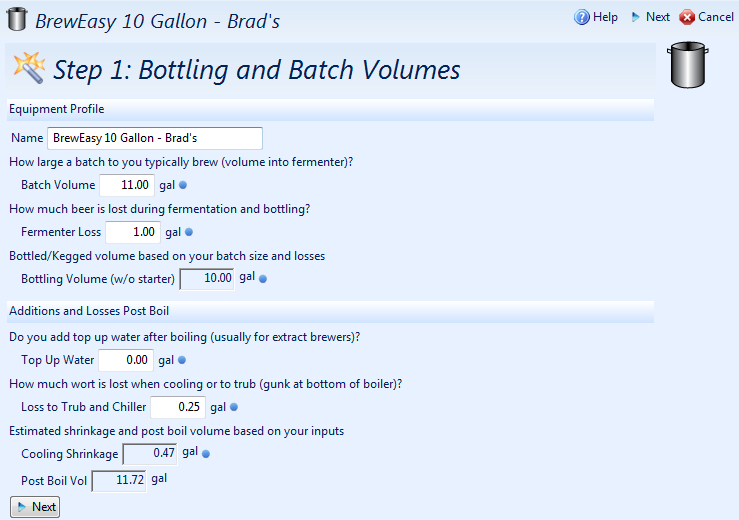 Near the bottom of the dialog you want to set your Large Batch Hop Utilization to 100% for home brew systems. It would only be higher if you were brewing commercial size batches. Finally at the bottom you can decide if you want to do a whirlpool/steep rest after the boil. This is usually done with a whirlpool hop addition to maximize hop aroma. A detailed description of the whirlpool features are covered here. Proceed to the next page. On the last page (step 3) you set your Brewhouse Efficiency. A good starting point is 68-72% if you don’t know what your efficiency for the overall system is. Note this is overall system brewhouse efficiency and not mash efficiency as explained here. Enter your Mash Tun Volume which is the capacity of your boil/mash pot. Note that for BIAB you want a pot that is at least double your batch size to account for grains and extra water used in the mash. The Mash Tun Weight is the approximate weight of your mash tun and is used to calculate how much heat it absorbs from the water during the mash. Similarly the Mash Tun Specific Heat is a factor based on the material used for your mash/boil pot. In most cases you will either have a stainless steel pot (which is 0.12) or an aluminum pot (0.21). Next is the Mash Tun Addition which represents recoverable volume below the mash screen. On some systems this volume can be large, and this setting will add more water to the mash tun to compensate. Finally the Lauter Tun Loss represents volume not recoverable in the mash tun. For most native BIAB systems both of these are zero since all of the water not absorped by the grain will be left in the pot when you remove the grain bag. Once you are all done save your equipment profile for use in your first recipe. I want to reiterate the importance of setting the Mash Tun Addition and Lauter Tun Loss fields for your BIAB setup. The Mash Tun Addition represents recoverable space below the false bottom and the Lauter Tun Loss is non recoverable, lost volume. If you are using a conventional grain bag in a pot, these should be set to zero since the grain bag fills the entire pot and you don’t lose any wort (except to grain absorption which is already calculated) when you lift the grain bag out. However many commercially available systems do have substantial volumes below the mash tun/false bottom and if you don’t account for it you may get a thick mash. I have a number of video tutorials here on the basics of creating and adjusting your recipe. The basic process is to add a new recipe, select your equipment profile created above, beer style and then start adding ingredients. Be sure to use the equipment profile you created above. However for a BIAB recipe you do need to select a BIAB mash profile in the lower section of the recipe design screen. Selecting a BIAB mash profile will force the program into a special mode where it sets zero sparge water and instead calculates the full water volume needed to do the mash and includes that in the mash. This volume includes not only the boil volume, boil off, trub loss, and mash tun losses but also extra water that gets absorbed by the grain. The program also uses a lower grain absorption factor (customizable under Options->Advanced) to account for the fact that more water gets squeezed from the grain bag than would be pulled out in a conventional mash system. If you have a small pot you may want to check the Mash Volume Needed field on the mash tab for your recipe to make sure all of your grains and water fill fit as volume can be a concern for high gravity beers. Choose from “BIAB, Full Body”, “BIAB Light Body” or “BIAB Medium Body” for most brews depending on the body required for your beer. This will adjust the mash temperature a bit to result in more or less dextrines in the finished beer. Once all your recipe is formulated, you should be able to switch to the brew day timer view or print out the Brew Steps and go brew your beer! If you want to learn the basics of brewing BIAB I cover it here. The concept is to heat water in your pot. Then you mash all of your grains in a grain bag (or other vessel for some commercial BIAB systems) by adding them to the hot water. When you are done mashing you simply lift the grain bag out and begin the boil. From that point forward you boil, chill, transfer and ferment as you would with any other system. I hope this article has helped you get started with BIAB brewing with BeerSmith! Thanks for joining me on the BeerSmith Home Brewing Blog. Be sure to sign up for my newsletter or my podcast (also on itunes…and youtube…and streaming radio station) for more great tips on homebrewing. I’ve never heard of the brew in a bag method! Excellent info! 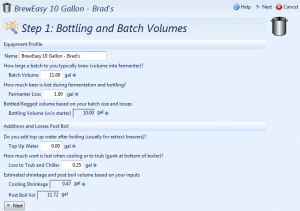 But could you comment on how Beersmith calculates (or not) BIAB water expansion? Through trial an error on my last few BIAB batches, in order to hit my marks I’ve had to manually decrease my starting water volume by about a quart as I’m starting out with ‘cold’ water and not the typically ‘expanded’ strike water. What should I adjust in Beersmith to account for this? Hope this makes sense. Thanks!!! This is something I wish was handled better in Beersmith myself. In order for an accurate starting volume, in your equipment profile, you need to change the “Cooling Shrinkage” from 4% to 0%. This change will give you an accurate starting volume at 60-70F water temps, but it will affect other volumes in your brew log. Your Pre-Boil volume is now not adjusted for expansion so just multiply what BS predicts and multiply by 1.04, same with Post-Boil volumes. I hope this helps. When using BIAB and the bag only takes up 2/3rds of the kettle does this affect the Mash Tun Addition volume? As the bag acts as a false bottom. Can you refer me to where BIABwith Sparge water options is documented? BeerSmith does actually take this into account and adjust the temp based on the volume occupied in the mash tun. If I want to utilize the “dunk-sparge” method for BIAB how should I adjust the equipment profile?